Unfortunately there is never likely to be a comprehensive biography of Eddington as his sister destroyed most of his personal letters when he died. On 11th January 1935 at a meeting of the Royal Astronomical Society in London the aspiring young Indian astrophysicist Subrahmanyan Chandrasekhar presented his ideas on white dwarfs and stellar collapse, only to have them severely attacked by the well known astrophysicist Sir Arthur Eddington. This book revolves around this day, looking at what led up to it and what the effects were in the following decades, with the eventual acceptance of Chandra's ideas and the possibility of total collapse to a black hole. 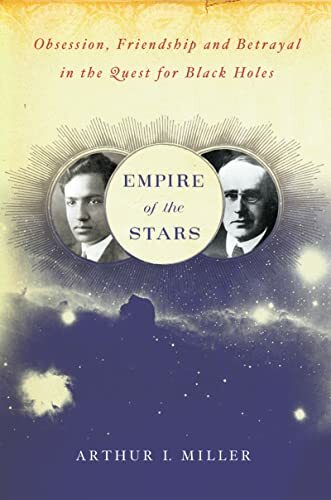 The story as presented in many books (and unfortunately in the 'blurb' for this one) is that Chandra was so put off by Eddington's words that he turned to a different field of work, and so the study of black holes was delayed by several decades. In fact the book tells a different story, Chandra continued work on white dwarfs, and within 10 years his view was accepted. Several other fields, such as general relativity and the theory of supernovae, needed to advance before black holes could become popular. In this book we are told what was happening in the intervening decades to allow this to happen. The book is based around the life of Chandra, but isn't purely a biography of him - for that you might want to look at Chandra by K.C. Wali. (You might also be interested in this discussion at physicstoday.org) Rather, Chandra's life and work is put into the context of that of other astrophysicists. Its a fascinating story, and demonstrates Miller's skill in sorting out the interactions between the different players. It might be a bit confusing for those who don't already know the basics of the story, especially at the start, which begins with the fateful day and then goes back to look at what led up to it, but switches between Chandra's story and that of the established Cambridge astrophysicists. However, this does introduce the reader to the prominent astrophysicists at the time - as well as Eddington there was Milne (known today for his model of the universe), Fowler and Jeans. Later in the book we see how the study of on stellar implosions was related to work on nuclear weapons, and in the final chapter we hear about the launch of the Chandra X-ray satellite in 1999. In 1935 Eddington was a prominent astrophysicist and it seems that this led others to accept his intuition even although the maths seemed to be saying something different. It is certainly something of a puzzle as to why what he said was accepted in public, when in private many people thought he was on the wrong track. Today the pendulum seems to have swung the other way and established scientists indulging in a bit of speculation are likely to be quickly distanced from the mainstream of research. Possibly astrophysicists in the 1930's thought that the unification of quantum theory and gravity was just around the corner, which would sort everything out, including forbidding collapse to a black hole ( I think that this may still happen, see Black Holes - do they exist?). Hence those such as Eddington with the 'right' intuition were given a lot of leeway, although with hindsight some of his ideas were fairly way out. I feel Miller could have looked more at these aspects of the story - seeing what leads to the acceptance of new ideas and comparing the situation in the 1930's with that today. One thing which Miller does portray well is Chandra's perception of struggle against the scientific establishment. Chandra was editor of the Astrophysics Journal for many years and was awarded the Nobel prize in 1983, so in reality he was part of that establishment, but somehow he never felt that he had been accepted. He was something of a workaholic, and although in each particular subject area he worked on he achieved a form of completion (by writing a book), overall he sometimes saw his academic life as a losing battle. Indeed 'Our Song' to Chandra and his wife Lalitha was a song about being thrown into the ditch of death. This leads to the question of what is considered as success in an academic career. An early, spectacular breakthrough might ensure a secure career for a scientist, but to my mind a lifelong contribution to many different areas of a subject, as in Chandra's case, seems preferable. Looking back over the book I find that it divides into two parts - firstly the battle of January 1935 and secondly the work in the middle of the 20th Century which led up to the acceptance of black holes. Possibly taking either one of these on it's own would have lead to a more coherent work, with the opportunity to look more deeply into ideas. On the other hand I didn't notice this split while reading the book - Miller has put together a story for a non-expert reader, and for those wishing to delve deeper there are plenty of pages of notes at the end. This book has been shortlisted for the 2006 Aventis science book prize , and my feeling is that of the six contenders this best represents what a 'Popular Science' book should be - I would tip it as a possible winner.